Cookbook author Mindy Toomay's blog about eating for health, cooking with spirit, and celebrating life in northern California. Here she dishes up food rants and raves, recipes, and plenty of kitchen wisdom. By your own efforts, waken yourself, watch yourself, and live joyfully. Why not make a daily pleasure out of a daily necessity? Here is a reprint from last year, by special request. It utilizes a fruit and a vegetable most abundant this time of year. Use an extra special olive oil for best results. There are many small-production organic brands to choose from. They cost more than the olive oil you're used to cooking with, but the flavor and high-quality monounsaturated fatty acids make them well worth the splurge. Keep a bottle on hand for raw uses, such as the one described here. Over the years, I have learned to cook many strange fruits and vegetables. Strange to me, that is. In some parts of the world, such things as starfruit and lotus root are perfectly ordinary. Anyhow, being a rather fanatical foodie, I'm interested in all members of the vegetable kingdom and forage for the unusual at my favorite produce market. It has expanded my culinary horizons to invite peculiar produce into my kitchen and see what I can make of it. The dish is based on very simple Mediterranean flavors and is light and refreshing, yet somehow deeply satisfying. I use an Asian mandoline to slice the fennel very thinly. It is made out of hard plastic and comes with various metal blades for cutting different shapes. If you don't have such a tool, simply use a sharp knife and slice the fennel as thinly as you can. If you can't find blood oranges, you can use tangerines or naval oranges instead. The salad will still be very, very good to eat. The one shown here includes no onion-y flavor note, but you can snip on some chives or sprinkle on some minced shallots, if you so desire. Sometimes I arrange a handful of Nicoise olives on the plate, as Chez Panisse did, which provides another delicious layer of flavor. Some shavings of Parmesan or a bit of crumbled blue or feta cheese are other great additions. Play around and see what you like. 1. Trim off the base of a fennel bulb and discard the outer layer, which is usually discolored and rather tough. At the other end, trim off the leafy stalks. Using a mandoline or a very sharp knife, slice the remaining bulb crosswise into very thin shreds. Make a bed of the fennel on a large serving plate or platter. 2. Slice off both ends of 2 or 3 (depending on their size) blood oranges . Using a very sharp paring knife, cut off the peel of the oranges, along with the white layer and the membrane that covers the orange segments. Slice the blood oranges into about 1/4-inch thick slices and arrange them in concentric circles atop the bed of fennel. 3. Sprinkle on a bit of salt and grind on some black pepper. Drizzle a really good olive oil evenly over the oranges and fennel. You don't want a big puddle of it on the plate, but don't skimp. 4. Scatter some whole leaves of flat-leaf parsley over the salad and serve at room temperature. I go way back with ramen, those dried noodles sold in little celophane packages in every supermarket in the world (it seems). When I was about 11, my mom started taking occasional nights off from the bother of cooking for her less than appreciative husband and three kids, and told us to make ramen for dinner. So I'd boil some water, drop in the noodles and the contents of the "flavor packet," and wait for everything to be done, about 4 minutes. It was easy, it was quick, and it was pretty darn tasty to my as yet undiscriminating taste buds. Today I don't want to go anywhere near that little foil packet of chemicals. I avoid MSG whenever possible and am suspicious of any flavors that don't come from recognizable foods. But the noodle part I still love. Give me pasta for lunch or dinner any day of the week -- actually I limit myself to only a few pasta-based meals per week from sheer force of will. I love Italian pasta (pesto or pomodoro or con funghi or a dozen other sauces), Thai pasta (pad thai), and Chinese pasta (chow mein). Then there's Vietnamese pasta (pho), steaming bowls of rice noodles served in fragrant broth with any combination of yummy morsels on top. Beef pho is traditional, but I am lucky enough to live in the vicinity of a restaurant run by Vietnamese Buddhists who serve up incredible rice noodle bowls and dozens of other traditional foods, sans the meat. I still eat ramen, too, dried Chinese egg noodles I cook in vegetable broth with my favorite Asian ingredients. Today it was tofu, broccoli, thinly sliced onions, fresh shiitake mushrooms, and lots of grated ginger. Spiked with soy sauce and sprinkled with togarashi -- a Japanese table condiment made of ground peppers, sesame seeds, and sea vegetables -- it's a delicious and nutritious meal in a bowl. I keep organic Asian noodles in the pantry these days, buckwheat and rice varieties as well as wheat, and enjoy my ramen nights even more now that I did as a kid. Wish mom was still around to share them. Do you feel stuck when it comes to vegan appetizers, perhaps because your parents' coffee table was always laden with cheese and crackers and clam dip and chips whenever guests arrived? #1. Most everybody loves hummus. I like to lighten and liven up the classic version by adding well steamed carrots to the food processor along with the garbanzo beans, lemon juice, tahini, garlic, parsley, and salt. A little cumin and cayenne are always welcome, too. #2. Dried tomatoes in a jar are delicious mushed up with garlic and green herbs. Parsley works fine, but I love using mint, rosemary and a small amount of chile flakes. The result is a little bit tangy, a little bit sweet, and a little bit spicy. Serve the two together for a nice color and flavor contrast. You may come to love these two spreads so much that now and then graduate from appetizer status to become lunch or dinner unto themselves. Here is my idea of the perfect winter salad. It is somehow light and substantial all at the same time, and provides a mostly raw experience without being too cooling to the system. The salad ingredients could vary somewhat, but I highly recommend this exact combination. Start with a bed of spinach, add some shredded red cabbage and cooked brown rice. 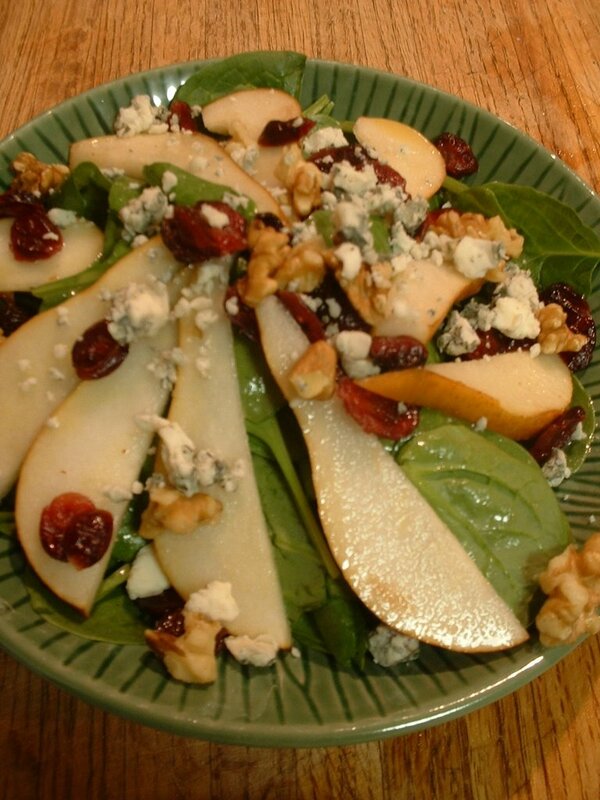 Slice a perfectly ripe pear and toss with a little lemon juice, then arrange some slices in a pinwheel design on each salad. 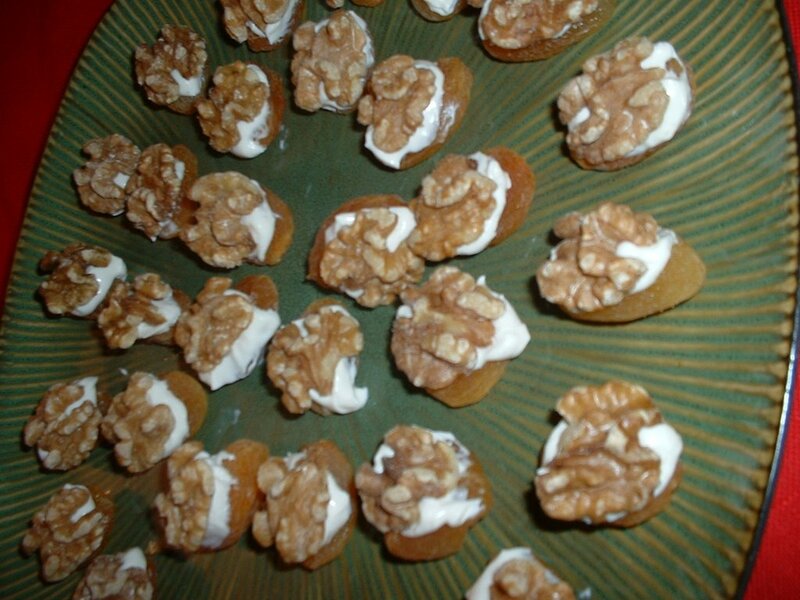 Add a few raw or roasted walnuts and a sprinkling of a creamy blue cheese. Drizzle on the dressing and enjoy. It's a simple and scrumptious lunch for you and a friend. It might seem counter-intuitive to have a cold and creamy beverage on a cold winter day, but in fact it makes some sense. A smoothie, as it happens, is a great medium for lots of "boosters," ingredients that have special nutritive powers. Pictured here is a four-fruit smoothie. The base is equal parts grapefruit juice (freshly squeezed is best) and plain yogurt. This went in the blender, to which I added a cut-up apple (unpeeled if organically grown; the skin carries fiber and vitamins), a banana (peeled, of course), and a cup of frozen raspberries. Now come the boosters. I sprinkled in a teaspoon of vitamin C crystals (powdered ascorbic acid) and a couple of tablespoons of ground flax seed (for its fiber and omega-3s). Then I added 2 ounces of aloe vera juice (soothing for the digestive tract) and squirted in some echinacea tincture (legendary immune booster). The latter tastes very bitter on its own, but is perfectly palatable in the smoothie context. Those are apple wedges on the rim of the glass, BTW, but lemon or orange also make nice garnishes, and/or a sprig of fresh mint. Drink nice and cold, if that appeals, or pour it into tall glasses and let it sit around for a while. Let it come to room temperature and it won't chill you to the bones. Mother Nature will take care of that! There you have it, a very simple and immune-boosting breakfast or lunch. Have you heard of the slow food movement? Some folks in Italy started it several years ago to promote the idea that eating and cooking should be honored as meaningful traditions to be savored and celebrated. It's the polar opposite of the fast food mentality. I'm a slow foodie, for sure. Yet sometimes the clock gets in the way. Some days, that slippery eel called time wiggles out of my control and suddenly I've got maybe half an hour to eat, brush my teeth, and get out of the house for a meeting or movie or poetry reading at the local bookstore. These tacos are for just such occasions. They're also great for when we're just plain famished and want some wholesome food in our stomachs as soon as possible. 1) Heat a dab of oil in a small pan. Add a few shreds of finely chopped onion and mushroom and cook for 2 minutes over medium-high heat. 2) Now add half a can of your favorite veggie chili (or 3/4 cup of cooked beans and a teaspoon of taco seasoning), a handful of baby spinach leaves, and a drizzle of water. 3) Keep the heat medium-high and let it bubble for 2 or 3 minutes, stirring every so often, while you heat up a couple of corn tortillas, which I generally do by laying them one at a time on the grill of a gas burner on my stovetop, turning 3 or 4 times as they warm and puff up slightly. 4) Fill the tortillas with the bean mixture and add some salsa and cheese, if desired. You've cooked a meal in no time flat, now slow down and enjoy it. Yes, breathe between bites and really taste what you're eating. Buddhist philosophers like Thich Nhat Hahn would call this mindful eating. If we're present for each moment, our minds focused on the sensory information contained in the here and now, we can experience true peace and pleasure. And that's the best thing about being a slow foodie. I adore Japanese food. 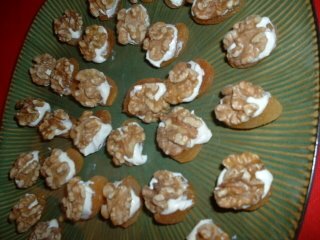 The flavors are light and simple, the ingredients wholesome and fresh, and the presentation at restaurants quite lovely. The Japanese have made cooking an artistic and even spiritual pursuit, and I feel deeply nourished by the aesthetics of a Japanese meal as well as by the food itself. Sadly, I know many vegetarians who steer clear of this particular ethnic cuisine, thinking it is all about fish or meat. In fact, there are lots of vegetarian options on Japanese menus, and I've found restaurants that will happily make substitutions or honor special requests. In the home kitchen, many traditional Japanese dishes can be adapted to the meatless diet. Sukiyaki is one example. The vegetarian version might not pass muster with a Samurai chef, but it's delicious just the same. Sukiyaki is traditionally made with thin slices of beef, but tofu makes a great substitute. The only other ingredients are veggies, broth, and a few Asian seasonings. 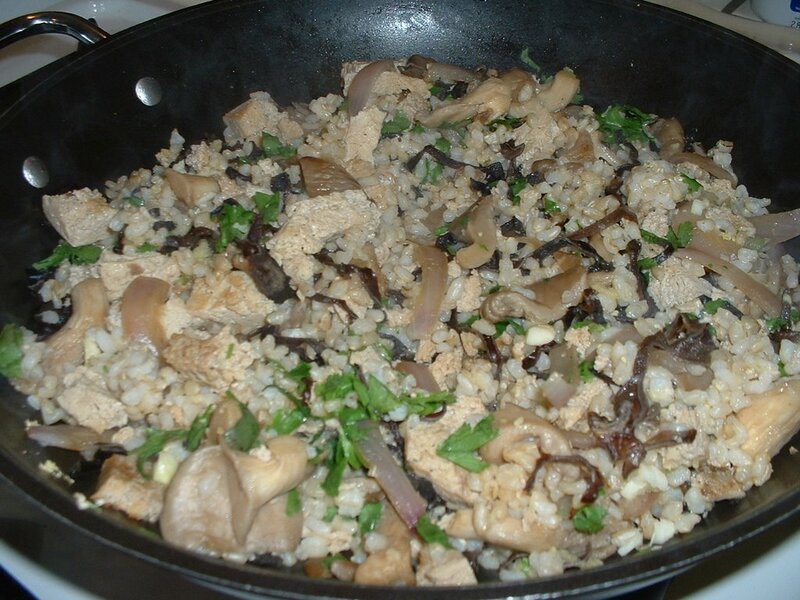 Oh, and brown rice as accompaniment, so be sure to cook up a batch. I'm lucky to have a huge Asian grocery store in my neighborhood, where I frequently shop for shiitake mushrooms, tofu in an amazing array of forms, Asian vegetables like choy sum and diakon radish, and all manner of condiments. For this recipe, the specialty ingredients you'll need are mirin, a sweetish rice wine, soy sauce, and dark (roasted) sesame oil. Fresh ginger is a nice addition, but not essential. The preparation couldn't be simpler. 1. Begin by heating a little dark sesame oil in a saute pan, than add thinly sliced vegetables of your choice. For this version I used onion, carrot, and yellow bell pepper. Add a pinch of salt and saute for a few moments, just to start sweating the vegetables. 3. Add slabs of tofu, which should be submerged in the broth, and add a layer of coarsely chopped or sliced shiitake or oyster mushrooms, cover, and simmer for 5 or 6 minutes. 4. Pile on your favorite leafy greens. I like spinach or the aforementioned choy sum. Bok choy and mustard greens are other good choices. Cover and simmer another few minutes. That's it, a quick and simple and light and lovely ode to Japan. 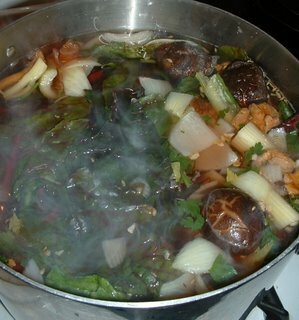 I'm welcoming 2007 with lots of healthy cooking, including soups, sautes, grains, and greens. In my part of the world, the weekly farmers market operates year-round (except in pouring rain) and these days large leafy bundles of winter greens are regular offerings. I especially love bitter and spicy greens, and rapini, aka broccoli rabe, probably tops the list. Its mildly bitter flavor pairs well with all things Sicilian, such as olive oil, tomatoes, pasta, and black olives. In fact, this very combination of ingredients is one of my old standbys. Rapini also makes a wonderful side dish. Simply saute some minced garlic in olive oil with a pinch of chile flakes, pile the chopped broccoli rabe on top and add a couple of tablespoons of water. Sprinkle with salt and cover the pan tightly. About 6 minutes later, the greens will have wilted into a delicious mound. A little lemon juice or vinegar creates a nice balance of bitter/spicy/sour flavors and aids in the digestion of the calcium contained in those dark green leaves. We're having a cold snap here in the SF Bay Area. I know it's nothing compared to what folks in other parts of the country and world are going through, but cold is cold. So the super-spouse and I decided to huddle together, watching a good movie (Who Killed The Electric Car?) and slurping a steaming, spicy soup. Some of my blog visitors have said I eat an awful lot of soup. Yes, as a matter of fact I do. It's good for you, plus I love making it, plus it's one of my favorite things to eat. So yes, soup again, and soup almost all the time in the colder months. And also brown rice again, because it's on my top 5 list of nutritious and versatile ingredients that are so convenient to keep on hand. I cook a pot of brown rice once a week (sometimes twice) and eat it as breakfast gruel, wrap it in chapatis with veggies and sauteed tofu for lunch, and serve it under roasted veggies with miso tahini sauce for dinner. But today it was soup, with cooked brown rice and cabbage and cauliflower and chickpeas and tomato and coconut milk and curry powder and lots of garlic and ginger. It was so delicious and warming and nourishing and easy to digest. And BTW, the movie IS great, and important, and infuriating. Let's all go out and buy electric or at least partially electric cars tomorrow, okay? Because if we do, the global warming problem will be taken care of and the urban air quality problem will be taken care of and the foreign war problem will be largely taken care of. And then let's all put solar panels on our roofs so we can charge our cars without burning coal or building more nuclear power plants! Or at least let's make delicious vegetarian soups for ourselves and our loved ones, so we can all stay warm and healthy. When it's party season, it's helpful to have a few festive appetizers in one's repertoire that are simple to make and never fail to please. Here are three of mine. Carrot/Garbanzo hummus: I often make a lightened up version of hummus by steaming carrots and combining them with cooked and drained garbanzos in equal parts by volume. The other ingredients are tahini, garlic, lemon juice, salt, cumin, and cayenne to taste. Dried tomato/artichoke spread: My favorite festive red spread is made by combining oil-packed dried tomatoes (well-drained) with drained artichoke bottoms (sometimes called crowns), garlic, Herbes de Provence, pepper, and salt if needed. I generally serve these spreads together, with slices of baquette alongside, and include raw cucumber slices as a fresh and crunchy counterpoint. Now for something more "composed" and quite suitable for an elegant meal. It serves well as an appetizer, but has a gentle sweetness so could also make a light and lovely dessert. Start by blending tofutti (or light cream cheese for non-vegans) with enough honey or maple syrup to achieve a slightly sweet flavor. Add a good pinch of allspice and mix well. Mound small portions of this "cheese" on whole dried apricots and top each one with a walnut half. Sweet, creamy, chewy, crunchy -- these are complex in texture and really yummy. My party guests always ask for the recipe. Holiday blessings and bon appetit! I probably wouldn’t be such a wild mushroom fanatic if it wasn’t for my good friend called Anna Morel. A biologist by training, she became interested in mushrooms a couple of decades ago and has been an avid forager ever since. At (somewhat) regular intervals, my fridge is replenished with freshly-plucked chanterelles, boletes, maitake, morels, and other delicious and health-enhancing forest fungi. Many wild mushrooms have healing powers, but lots of people I know never eat them. Perhaps the fact that some species can kill you scares them off. They prefer to stick with those pale but exceedingly safe supermarket buttons, which are not without merit but can’t hold a candle to their intensely flavored country cousins. Even if you don’t have a mushroom expert in your life, you can enjoy the exotic flavor and immune-boosting qualities of fungi by eating shiitake mushrooms often. The shiitakes we find in urban markets these days are domesticated specimens, not picked in the wild, but they’re potent nonetheless. If you’re a do-it-yourselfer, by all means buy a shiitake-inoculated log sometime and grow your own. It’s a very cool science project if you have kids in the house. The photo is of one of many Asian style sautes I've made recently. Simple, delicious, and beautiful to look at. 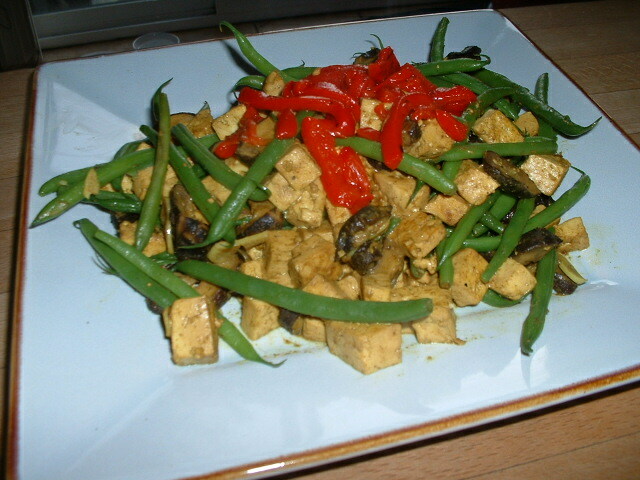 Shiitakes, tofu, green beans, ginger, garlic -- and those are strips of roasted red pepper on top. BTW,there's actually a good scientific basis for the wonderfully satisfying taste of shiitakes. They naturally contain two nutritive compounds, called glutamate and guanylate, that provide an intense umami flavor. That is not a typo. Umami is the fifth taste, dontcha know. Our tongues are not restricted to tasting sweet, sour, salty, and bitter – as was believed for hundreds of years. We can also distinctly detect when a food is deeply savory, and that taste was named “umami” by one of the Japanese scientists who made this discovery. Other umami foods include Parmesan cheese, tomatoes, certain shellfish, green tea, sweet potatoes, and soy. Monosodium glutamate is an umami-enhancing condiment, but because of its high concentration of the glutamate, many health experts consider it harmful. Live long and prosper. Eat your (wild) mushrooms! 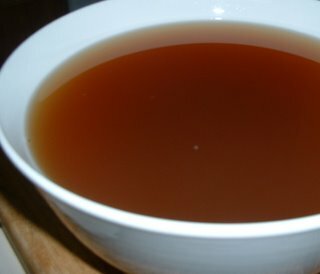 This morning, I knew that all over the country, people were tossing turkey carcasses into stockpots, along with some aromatic veggies, to make a batch of stock for leftover-turkey soup. I watched my mother do it every day-after-Thanksgiving during my childhood, and used to do it myself. Today I had no turkey carcass, of course, but I wanted soup. So the super-spouse and I cut up some potatoes and carrots and celery and onions and put them all together in a big pot. 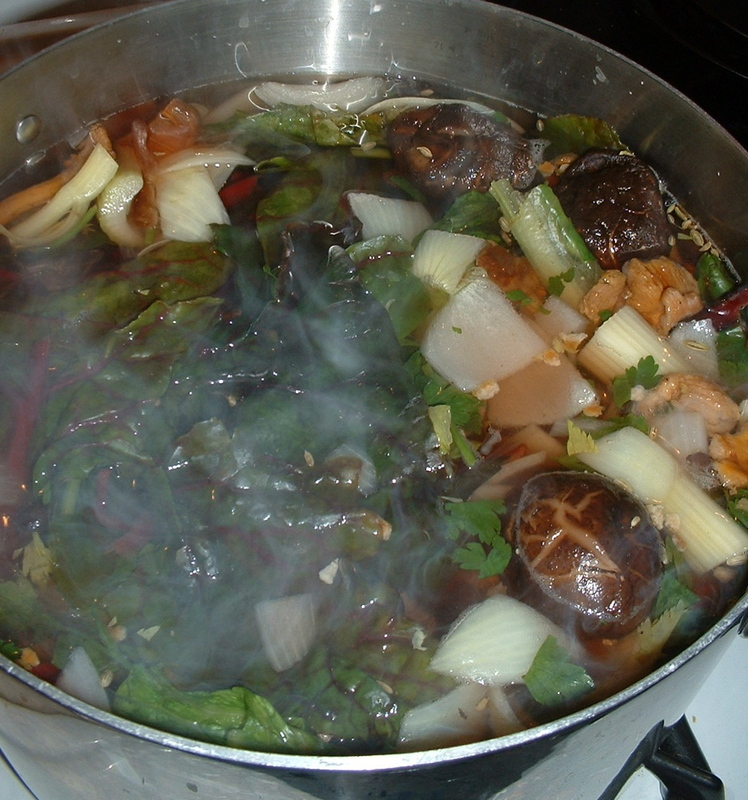 We added some shiitake and chantarelle mushrooms, chard leaves and stems, garlic cloves. Seasonings included allspice berries, fresh rosemary sprigs, peppercorns, and half a lemon. All this was submerged in lots of filtered water, then brought to a boil. I turned down the heat and simmered the lot for about 45 minutes, then strained out the veggies, pressing out as much liquid as I could. The yield of our minimal labors: a few quarts of this deliciously rich and beautifully brown stock, some of which is stowed away in the freezer for future use. For tonight's healthy and warming repast, I put some of the stock in a saucepan, added cooked brown rice and cubes of tofu, and simmered for a few minutes. Just before serving, I added 2 sheets of nori seaweed snipped into little squares and a tablespoon of miso diluted with a bit of water. That's coarsely ground cayenne pepper sprinkled on top. Said super-spouse and I found this humble Japanese country soup as satisfying as any meat- and noodle-laden concoction our mamas might have made. Now it's official, you know. The holiday season has begun. I vow to not go crazy with it all, to keep my life and my cooking simple and wholesome. Unless I consciously decide to go crazy and cook something truly extravagant now and then. Which is likely. We've all been thinking about Thanksgiving, haven't we? -- pondering how to make a very special meal without succumbing to the national passion for roasting birds. Among the vegetarian cooks I know, hosting Thanksgiving dinner is an enjoyable challenge. It's a great time to pull out those complex recipes we've always wanted to try and pull off a fabulous non-traditional feast that will impress even die-hard carnivore uncle Hank (or aunt Louise or brother Bill -- doesn't every family have at least one member for whom meat is a must?). I've been known to make autumn vegetable "lasagna" on Thanksgiving, using thin layers of polenta in place of noodles. One year I made a lovely veggie-filled roulade from Anna Thomas's classic, The Vegetarian Epicure. Anything labor-intensive, even downright difficult, will do. This year I'm contemplating making my first giant timbale. I've made small ones in the past (a corn timbale with blackberry sauce comes to mind) but never the big Sicilian pasta-filled pastry traditionally stuffed with meatballs and diced salami and veggies, all bound together in a rich bechamel sauce before being wrapped in a piece of pastry dough and shoved in the oven. I'm thinking a vegetarian version could be very nice, with artichoke hearts, cubes of roasted eggplant, green beans, cauliflower, dried tomatoes, baby mozzarella balls, etc. Just thinking about it puts me in the cooking mood. If you're having a hard time picturing such a thing, you must rent the movie Big Night, which is one of the best food movies ever made. The little photo (which I borrowed from lex culinaria) will give you the idea -- keep in mind that that beehive-shaped thing is the size of a large inverted salad bowl. On the side, a spinach salad with dried cranberries, maybe, and toasted walnuts, and pears or persimmons -- like the one I made last night. It's wearing honey mustard vinaigrette. And I'll serve pumpkin pie for dessert. That's one part of the all-American menu I always include, because I love it so, but maybe for a little twist I'll make cinnamon and orange zest-laced whipped cream to go on top. In my mind's eye, it's a beautiful spread and delicious repast. HOWEVER, let's not lose perspective during this time of feasting. Eating very simply when the rest of the country is gorging would be a fine Thanksgiving tradition. We could even try not eating at all -- taking a healthy break from our patterns of over-consumption. Whatever we eat or don't eat this Thanksgiving, let's take a long moment to really be quiet and consider how interdependent we are with all the plants and animals (including, of course, people) that share this planet. Are we not blessed to have plenty of nourishment in our lives -- especially that heart food called love? Almost always, I have a package of tofu in my freezer -- never opened, just as it came from the store. That's because I love what happens to it when it's been frozen and then thawed. What was once a lump of smooth and succulent soybean curd becomes chewy and spongelike. Can you see the difference in the photo? 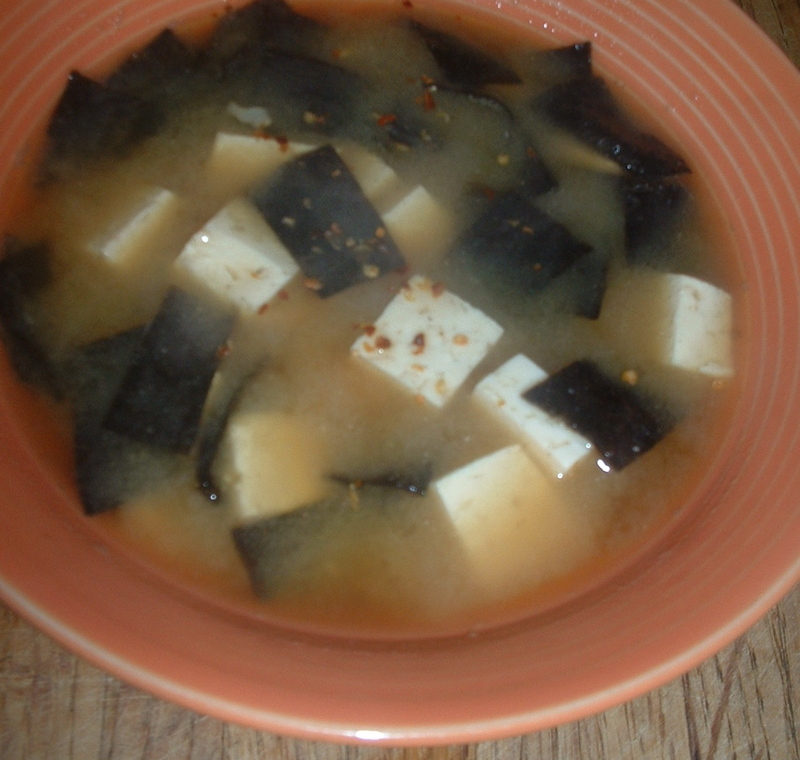 And even more so than with fresh tofu, it soaks up flavorings and adds a very satisfying texture to a saute or soup. There's nothing to it, really! Take the package out of the freezer and let it stand at room temperature for a few hours before you plan to use it. Then remove it from its packaging and very gently squeeze it over the sink to remove most of the water. Then dice or cut into thin strips and use anywhere you'd use regular tofu. This time out, I sauteed some onion and oyster mushrooms in roasted sesame oil with strips of thawed bean curd, splashed in some soy sauce, then added garlic and ginger. Sauteed for a time, adding water as needed to keep the mixture barely moist. When the mushrooms were almost done, I added some cooked brown rice and cilantro (at which point I took the accompanying pic), then piled on some chopped choy sum, which is a close relative to bok choy, the more common Chinese green. Put on a lid and let cook for another 5 minutes or so. Delicious! If you're a vegetarian and eat a lot of tofu, as I do, variations on the bean curd theme are always welcome. I encourage you to try the frozen/thawed version, if you haven't already. It may open up a new window of inspiration. In the writing and editing business, deadlines rule the day (and week and month...). Though I most enjoy lingering with loved ones over a long, luxurious supper, many times I make due with a quick and simple one-dish wonder and then go back to work. And then there are times when I don't even stop working to eat. Last night was such a night. I knew I needed to work another couple of hours on the editing job at hand, but my energy was slipping and I knew I couldn't put off eating that long. Frozen gyoza to the rescue! I have made gyoza -- the Japanese version of potstickers -- from scratch, and they're the most delicious little morsels. But of course that is a labor of love, not to be undertaken when other love-labors are pressing. Luckily, I live just a few blocks from a massive Asian grocery store that stocks many different varieties of gyoza in the freezer case. Pork and chicken and shrimp are most popular, apparently, but they also sell varieties filled with mushroom and spinach and chives and tofu. Trader Joe's sells a perfectly good vegetable gyoza, in case you don't have an Asian market nearby. For an added flavor kick, make up a little dipping sauce to go alongside. Mine starts with equal parts tamari soy sauce, rice vinegar, and the Japanese rice wine called mirin. Then I add about a teaspoon of roasted sesame oil and a short squirt of that bright red Asian chili sauce. It's a quick and really delicious condiment. I love those same Asian flavors in salad, too, so I tossed together some shredded red cabbage, thin coins of carrot, red onion bits, and fresh arugula. For dressing: a splash of tamari, another of rice vinegar, and a few grinds of black pepper. Scattered some toasted sesame seeds over the top, and done! It came together in about 10 minutes and I ate it ravenously, accompanied by a tiny cup of warm rice wine. Did the trick, and good thing... I ended up working until almost midnight! I don't recommend the latter, but I do suggest you try whatever frozen veggie gyoza you can find. It sure comes in handy when time is short. Then someday, when it isn't, maybe you'll be inspired to make your own. Cooking well is a powerful practice and eating well a pleasure to be shared. Today, begin bringing more creativity and consciousness into the kitchen. Your life will be happier, and maybe even longer, for it. Blessings and bon appetit!